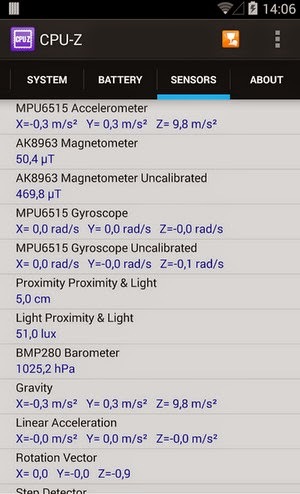 All the info you need about your android's Cpu, Gpu, battery, sensors and much more. 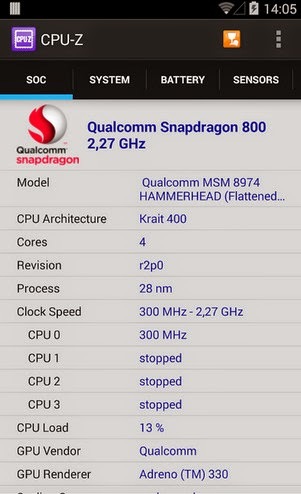 Download CPU-Z 1.08 Apk (ad free) and know your device info! In case of bug, please open the application menu and choose "Send Debug Infos" to send a report by email. Version 1.05 removed Root Access detection because that information was wrongly reported on lot of devices. Restored in 1.07. - Added Rockchip & Mediatek chips. - Improved Qualcomm SoCs detection. - Improved NVIDIA Tegra detection. - Added ads page at application close. - Added SoC scaling governor. - Validation button in action bar.